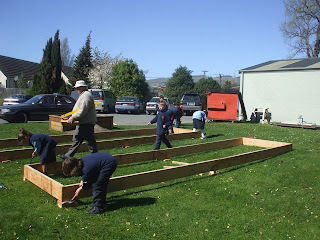 Yesterday, members of our Green Team were very excited to see the arrival of the new raised beds for the vegetable garden. 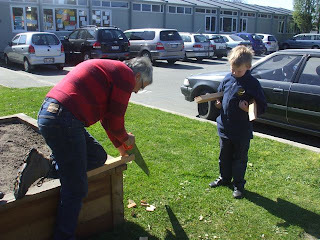 Together with Reg Platt of Fresh Harvest Planters, and Graeme Wood, (friend of the school and great supporter of the Green Team), the children assembled the two new beds. There was much hammering of nails and sawing of pegs and the beds are now all ready to go! Thank you again to Reg for making the beds, and to Graeme for his continued help and advise. Four cubic metres of soil will be put in them today along with some donated compost from the Strictland St Gardens. The team is all ready to get planting!! !